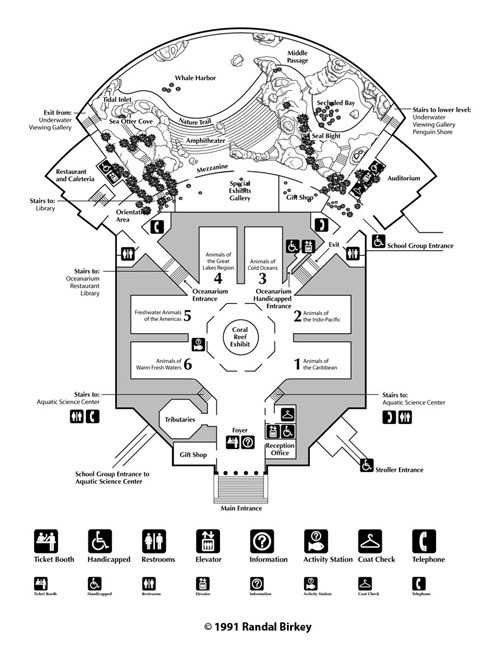 Randal Birkey was contacted by the world famous John G. Shedd Aquarium and Oceanarium in 1991, to illustrate their new campus map, and new facility floor plan based upon the major building expansion project they were completing. Based upon architectural and engineering blueprints, Randal constructed a new campus master floor plan in Adobe Illustrator, reflecting the addition of the Oceanarium, and the location of all important areas for visitors. These were printed and used by museum docents to direct visitors to areas or amenities of interest or need.